Fresh and Rich Coffee: This cone brews tasty coffee full of aroma in a minute without bulky and expensive espresso machine. Be sure to use high-quality coffee and enjoy! Convenient Capacity: This maker can brew over 3 oz at once - enough for big cup of Americano or ristretto. You can also add more water in the process and get as much coffee as you like. Large Brewing Hole: This hole allows you to create and enjoy the personal experience of making the coffee just as you like it thanks to different pouring speed. Lifetime Guarantee: Enjoy your coffee every day with the LIFETIME GUARANTEE. If there's any problem with your product, contact us for a refund. Your purchase today is 100% risk-free. 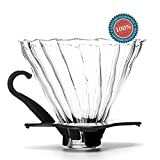 Neat and Elegant Design: The wavy glass and black bottom will fit any kitchen and will look nice over any cup or kettle you pour your coffee in. Enjoy not only the coffee but even the process. Do you drink coffee in the morning or throughout the day? Either way, the Vitabliss Coffee Brewer will meet your requirements. It's big enough to make you a single cup of coffee (3.4 oz. ), as well as a whole kettle for several people if you add more hot water in the process. Large brewing hole allows you to control the speed, so you can have coffee as strong and rich exactly as you like it. The design is unobtrusive and elegant and it fits any kitchen and coffee service. Order it now, get the lifetime guarantee and enjoy the rich and tasty coffee with no stress.